Have some brake work done (as there was alot of clicking and squeaking coming from rear brakes)...changing the pads (repainted calipers, etc). I noticed that the front calipers had damping pads...but the rears did not? Maybe this is why all the brake drama in back. Maybe not..?!??!? !...the old pads seem smaller then the replacements that I got...so maybe pads were too small in the caliper and were moving around a bit. First off, are these damping pads really needed? Are there alternate shims or anti-squeak options that have proven effective. Ideally, I want to add the damping pads....but not sure of the size I need to order....this would have have to be all 8 dampers for both rear calipers....this is for an 89 S4. I just changed my fluid and pads two months ago. I have the dampeners and pads that are supposed to be quite. The brakes squeal . Prior to the pad change I had no sound from the brakes with the same dampeners. Could be the pads or the wear on the dampeners. If the dampeners are old you could get some replacements. I think I'm going to try that and maybe some copper grease . I've had some success reusing the damper pads, gluing them to the backs of the new pads with hi-temp silicone adhesive. The little damper pads with the clips pull the pads clear of the spinning rotor, not only getting them back so they don't squeak but also cutting down on glazing. Since we have the relatively simple option of using them, exercise that option if you can. That said, there are other lesser options like the anti-squeal goo products. I say lesser because their purpose is to dampen the pad vibrations that you hear as squeal, but they don't actually draw the pads back much if at all. Ditto on the little pads you see sometimes, especially as OEM solutions on 'murrican cars. They are cheap and easy to add, and so are effective for the car builders. Essential to having any of these solutions work is having clean calipers, specifically clean where the pads ride on the caliper frames. On the 4-piston Brembo calipers on the 86.5+ cars, the contact areas include removable spring/wear plates that the corners of the pad ride against. These need to be clean especially behind the pads. Usually a blast of compressed air will do the job, but sometimes a little more aggression is needed. The plates are removable with care, but more than a few folks have reported that the screw heads give up before they can be removed. 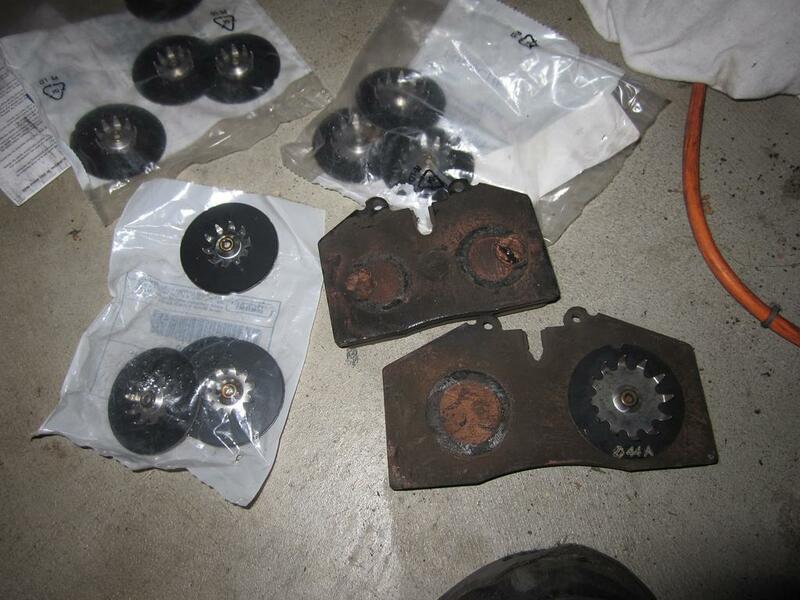 There are lots of opinions on whether rotors need to be turned when replacing pads. The pros will tell you that they always resurface or replace rotors, so they can manage the number of comebacks they get from customers with noisy brakes. Makes sense for them, maybe less for DIY owners with a $500+/set rotor habit. Nonetheless, a nice consistent rotor surface is required for proper initial pad break-in. I'm doing brakes now and am going to replace all of the dampers, pads, sensors and rotors. Before removal the car sounded like a Burlington Northern box car rolling through a Pittsburgh steel yard. Some of the dampers were still attached to the pads and some weren't, and one outside corner had the orange goo treatment between the dampers and pads - still made a lot of noise. I had a dust shield get a little bent out of shape and started rubbing against the rotor. So that might be a source especially if it’s constant (as in brakes on or off) and tinny sounding. I have had luck using comet to stop a squeak. Mix with water to make a paste and apply to the rotor. 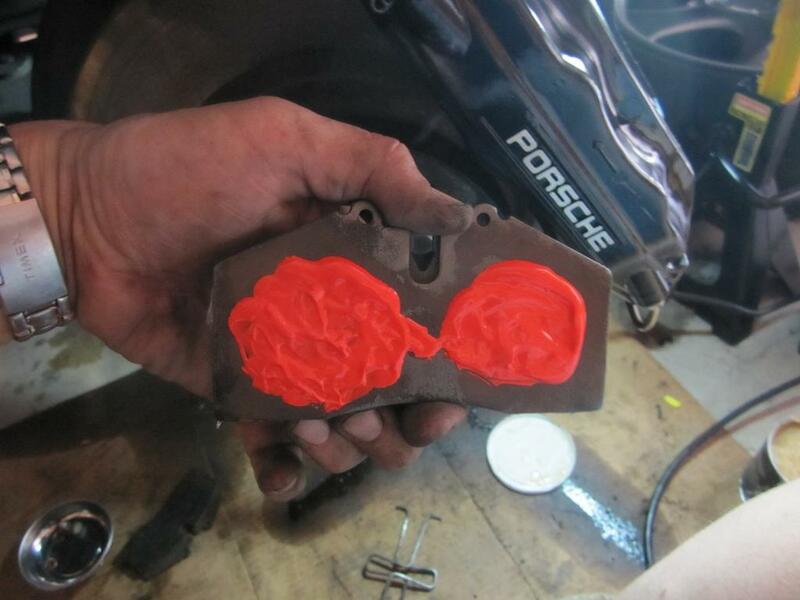 If it makes a rattling noise the you need dampers to hold the pad in place. I haven't had the dampers on my brake pads for the last 10 years. If I get more one squeak a month out of the brakes I'd be surprised. I put a small amount of antiseize paste on the backing plate only where it touches the pistons tops and the tabs the pad rests against. No problem. So much depends on what pads you use and how you use them. IIRC, Bill mentioned on the way to OCIC a couple summers ago that he had put in the Axxis/PBR Metal Master pads and really liked them. I've had the same pads in for most of the last dozen years. Maybe the no-squeek syndrome will go away when I change to the PBR ceramics. Bill, are you still running the Metal Master pads?